Do we live in central London, so it’s convenient for Paul’s work and all the activities this amazing city has to offer? Or do I need more trees? And if we get a house outside London, where do we go and what do we look for? We really have too many options available. But my need for trees is – pardon the pun – growing and hence the country house hunting is ramping up. But there is a dilemma. Views or house? House or views? Generally, when we garden we’re just working with what we’ve got. We can’t easily change the views and we have the house we have, so we put in some of our favourite plants and go from there. But we’re currently in the lucky position of renting a place in London and having time to find just the right thing. Except we’re not sure what that is. I could watch furry bumblebees all day! Part of me wants to embrace the history of England and find an old, characterful, heritage-listed house and attempt to create a Sissinghurst-style garden around it. And part of me wants the views of Broughton Grange as the back drop to my garden, providing soothing scenes from the house even on dark, damp days. And whilst these desires are not entirely mutually exclusive, view-friendly houses on the top of hills aren’t the best for delicate herbaceous borders and how long would we be waiting for a sheltered, heritage house on the top of a hill that meets all my contemporary wants for lots of light, an eat-in kitchen and ensuite bathroom, whilst being within a commutable distance, at a price we can afford? A visit to Ascott Estate with my mum, sister and nephews last month was a potential opportunity to explore this dilemma. The original part of Ascott house was built in 1606, the year of the first recorded landfall of Europeans on Australian soil. So quite a bit of character. And the views over the Vale of Aylesbury – including the village where I grew up – are incredibly green and far-reaching for being so close to London. So which won out at Ascott? The house or the views? I think for me, the views had the edge. But I soon realised this revelation wasn’t particularly revelationary. The house wasn’t my ideal type of period house and the garden around the house didn’t particular inspire me, so was it really a fair contest? It seemed to tell me that there is no ‘best’ answer to the house/views question and all that can be done is to look at each property on its own merits and after that, probably ignore any analysis and go with gut feel! Gut feel is perhaps how we put a value on a ‘sense of place’. Does this particular house feel unique and distinctive and special? Or is it those views and the setting that gives you goosebumps? I’m hugely excited to be exploring the idea of ‘sense of place’ for my Masters dissertation over the next year. We started this module with a workshop on Saturday and I’ve already indulged in far too many hours consuming wonderful books from the RHS library. How amazing it is to actually be able to justify reading all those books I’ve always wanted to have time to devour! Sense of place is such a vague, loose, airy-fairy idea, with an extraordinarily diverse range of definitions; where a definition has been attempted at all, that is. My mission is to pin this down to something more tangible; something that helps us create those goosebump-inducing gardens a little more consistently. From my reading so far, the first revelation is the difference between sense of place in Australia and the UK. Australia is all about natural scenery. I’ve travelled relatively far and wide and, for me, Australia’s natural sense of place is the strongest I’ve seen. It is so incredibly distinctive and unique. Where else has twisted, scribbly gums and bouncing marsupials, or anything like its own equivalent? But the UK is pretty good on its historical and architectural sense of place. Just so much has happened in this country and the stories that have been left in its trail really are hard to beat on the goosebumpometer. Oh, how ironic it is that Australia is highly urbanised and the UK more rural! Perhaps this tells me we should be focussing on the house whilst we are here and find a property with a view on returning to Australia. Or perhaps that’s just a useful perspective, given that we have just found a house that we feel is very special, in a very ‘non-viewy’ location. Paul is going to have the first conversation with the agent today, so it’s early, early days and we all know how fraught the UK house-buying process is, but it’s a start and we can hope. Cheery colours but perhaps a little too dated? One of the big questions, if we do end up with a heritage property, is how sympathetic the garden should be to the architectural era. At Ascott, the garden still feels decidedly Victorian, having been laid out in the late nineteenth century and staying true to that era over a hundred years later. I’m not sure I’m so keen on this style, but is the historic value worth preserving? I don’t believe gardens should be museums, but I’m interested in the connection between history and a sense of place. Maybe the Victorian style at Ascott isn’t so appealing because the house is not Victorian in style? Or perhaps I would prefer it if there was more of a mix of the new and the old. Keep the old structure and in fill with more contemporary planting, moving further away from the brash carpet-bedding idea, but within an historic framework. And I guess the answer is that each property needs to be looked at individually. There aren’t set goosebump-inducing solutions that apply uniformly at every site. But I do hope my dissertation enables me to propose some ideas that help steer us in the right direction. To find principles that any gardener can work to on any site, and a definition that’s a bit more concrete to hang our hats on. Giving pleasure is surely the number one objective of all gardens? I enjoyed the tour of Ascott House and the debate about a sense of place. I’ve always been drawn to the idea of a sense of place, so it was interesting to read your ideas, and I look forward to more on the topic once you start your dissertation…lucky you! Although we once lived in Sydney and it is a gorgeous city…I always breath a sigh of relief when we return to Canberra, and our lovely Brindabella Mountains. I know exactly what you mean about that drive from Sydney to Canberra. As you pass Campbelltown your whole body relaxes one notch and you feel life is that little bit less stressful! I loved living in both cities, but there is no question as to which gives you a better quality of life on a day to day basis. Hope to get a little of your perspective on a ‘sense of place’ as we go! Nothing wrong with your bag! I usually wear a small backpack – sufficient to carry my camera which is always with me – even around my own garden (the camera, not the bag). If your husband didn’t have work in the UK I’d say come back here to Australia! 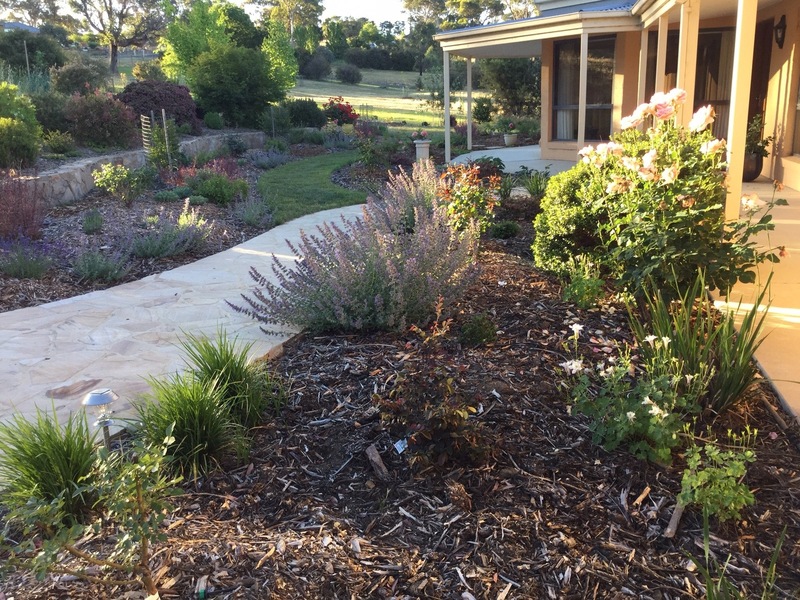 My husband and I found a lovely ‘old’ (not by UK standards) house on 2 acres in the Dandenong Ranges 7 years ago and now we’re making the garden our own and loving it. The trouble with cameras is that they aren’t half heavy! I think I’ve sadly got to the age where comfort trumps fashion. In fact, if truth be known, it’s quite a happy realisation! I do miss Australia and you are in such a special spot in the Dandenong Ranges, but I love it here in England too. I just feel very fortunate to be able to experience both countries, although in the middle of each move it doesn’t necessarily feel quite that way! I guess I’ve gotten used to carrying a camera around all the time but I agree they can be weighty. 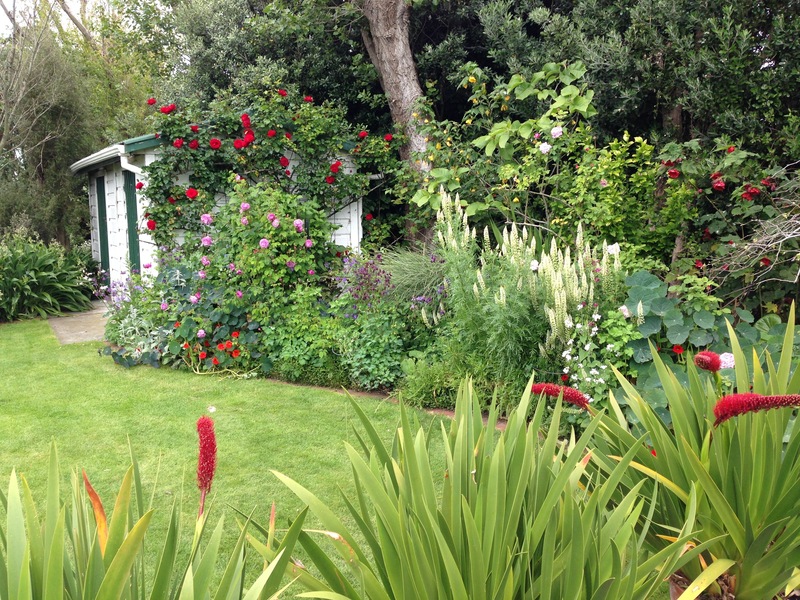 I love English gardens and they are my inspiration. Wish we had the garden photographer groups here that you have there. 🙂 But I do belong to a small group on Facebook where we share our images here in Oz. Gosh, dilemmas indeed…and interpretation of concepts! I’ll be interested to hear what you tease out and decide on for sense of place. The concept of what constitutes a view is another topic that intrigues me. Does it have to be a vista or panorama? I don’t need a long perspective and think the ‘a garden designer explores’ photo presents a much more appealing view than the previous photo or the horse pic. I’ve never been overly excited with wide open vistas/panoramas, at least not long term. They don’t hold my interest for very long. Perhaps this is a learned response. My childhood was spent in the bush…literally. It was a very enclosed view of a multitude of flora and fauna. I still find enclosed scenes with a wide variety of plants most appealing. There is always so much to see on many different levels…like your bumble bee. The planting to an architectural era is another concept that I struggle with…but enough for now. Good luck with that house. Did you see Michael McCoy’s post this week, entitled ‘Big Views Get Boring’? (http://thegardenist.com.au/2016/09/big-views-get-boring/) You are obviously very aligned with him! Most designers would say that a framed vista trumps a wide panorama but I have to say, I do like panoramas, too. I’ve probably not experienced enough of them to have developed my thoughts on them sufficiently. If we do buy a heritage house I’ll be doing a lot of research on garden design history as well as on a sense of place, so we can see where both lead me. Would love your input too. I’m sure it was you that got me all sense-of-place-obsessed in the first place (in a wonderfully positive way!). Yes, I certainly align with Michael’s post. Last week a friend and I went to a national park on the escarpment. We stopped to look at a view, a beautiful panorama of Perth and it’s surrounds. I spotted a plane and thought I would watch it land but within seconds something below me caught my eye. Neither of us gave that view more than 2 minutes of our attention; we were off into the bush looking at the myriad of flowers, insects and birds on offer. We drove past that view again on the way home. It didn’t rate a second glance. With regard to planting to complement eras I offer my own house as an example. No one in the 1920s would have planted a bush garden. It would have been lawns and roses and a few other tough plants some of which I probably have. However, the bush would have surrounded the property and there was still a lot of remnant bush when we moved here 40 years ago. So do I recreate a idealised style [’cause truth is that most gardens were very basic] or something that is more suited to what was in the surrounding environment, and given our changing climate, something more suited to today’s environment? I have maintained the very messy Canary Date Palms because of their historical connection to the house [mostly from family pressure!] and I do believe the historical context is important. What sort of garden would Acsott House have had originally? Certainly not what is there now. But historically they are very worthy. You see, I struggle with this concept. I do think my garden has developed a sense of place of here, where it is growing, in Perth WA. I no longer want to imitate an ideal from another place on this globe. It is my indulgence; it gives me immense pleasure, it provides habitat to many local species of fauna so I have achieved my goals. By Andrew Pfeiffer’s definition, it is a garden. And I’m so glad I’ve helped the sense-of-place obsession. Ascott House was originally a farmhouse, so I imagine the garden would have been very small and rustic. But the same would apply as you say with yours: you just wouldn’t want that now. It sounds like you have the concept completely sorted though. Mix old with new, adapt to make it practical and adapt to suit your own loves. I think you’ve worked it out perfectly and the sense of place you have created, with all its layers built up over the years is quite incredible. Thank you, Louise. I’m definitely a thinker! And you definitely worked and planned hard to achieve what you have with your fabulous house and garden. Some things in life happen by luck but a lot more need you to at least put yourself in the right place for the right type of luck to come along! I often go by gut and if I try to analyse things to back up that gut feel, it’s amazing how the logical behind it is always there. Our subconscious is a funny thing. Thanks for your good wishes and glad you liked Ascott! Ascott’s view over the surrounding countryside is indeed quite a draw, and while the house doesn’t convey as strong a sense of place as some, I don’t find friction between the two. I like many things about Ascott, including the colour-contrasted hedges that rise so majestically, one after another. The Lynn Garden by Jacques and Peter Wirtz, one of the more recent additions to the garden, is perhaps my favourite section. It’s on the opposite side of the house from the older sections. I hope you found it, Janna. It’s worth a return visit if you didn’t. Another thing at Ascott that I like — which I know many dislike — is the Richard Long stone sculpture/installation near the Venus fountain. While it sits uneasily in its location, I like the art itself and the idea behind it. I agree, I didn’t sense any friction between the house and views. However, I sadly can’t comment on the newer parts of the garden. I left way-finding to the less garden-obsessed members of the group who must have decided they had had enough before we got to those areas! I did notice them on the map as I wrote up the post and decided it was just a very good excuse for another trip back. Very easy to do as my parents still live close by and I’ll be sure to look out for the Richard Long sculpture too. I must have been walking around with my eyes closed! I should add that I have never visited Ascott in full summer when the bedding plants that you show were out in full force. Perhaps if I had, my feelings about the place would be different. I think I’ll take that as a challenge to get back there in all four seasons, Pat! Louise’s comment above made me quite emotional – she is so right. I miss the views I had in my previous gardens, although we do have views of country hills here (from some windows of our house), it is the overall ‘sense of place’ that is missing for me. Comments like those above just bring it all home with a crash. I remember saying to my husband years ago in that house with the great views and gardens I had carved myself from a felled pine plantation, that no matter how bad, or good, the weather was this place makes me feel good. Choose the place that makes your heart sing Janna – no compromises. Houses are just buildings that can be fixed and changed (to suit you), but not so your environment — no matter how much gardening you do or how lovely your gardens become, if you don’t have that ‘sense of place’ you will never be happy. Love Ascott gardens – love the lumpy hedges and most of the planting. Happy house hunting Janna – don’t rush. I think the more places you have lived in, the trickier it becomes. Your list of likes, dislikes, needs and wants grows with each move. I’m also very aware that a UK house really does need to be good in all weathers…for obvious reasons! I will listen to my singing heart, I promise. By the way, a felled pine plantation? Goodness me. I can think of few more challenging starts than that. No wonder you became very attached to it after all that work. Yes we bought 11 acres of which 3 acres was a ‘pine plantation’ and we had that removed. All sloping land in the Dandenongs. Of course they were exactly where we wanted the house and garden. It wasn’t too bad really after the initial clean-up – amazing what comes out of the ground though. I had a rotary hoe so that made making the garden a bit easier. Ended up with a two acre garden and sold that after almost 7 years. Thank you Adriana for your kind words. I was somewhat vulnerable in that last post. It was lovely that you felt what was intended with those words. All the best. A wonderful and thought provoking post Janna. I particularly like the quote from Andrew Pfeiffer about gardens. I am just starting a brand new one in Tasmania (with the help of the wonderful Catherine Shields and Alastair Houston) in a bush setting. There are numerous challenges including possums and wallabies to contend with, together with the need to plant fire resistant plants within the bushfire management zone. Good luck with your house hunting – I look forward to hearing about a successful conclusion. Bridget, I’m in the Dandenong Ranges in Vic – would love to hear and see your progress for your project. We’re turning 3/4 acre bushland into a garden here. Thanks ever so much, Bridget. The precise wording of Andrew’s quote is just magic, isn’t it? How amazingly exciting to be developing a rural garden in Tasmania. I just adore that island. If I was told I was to live there for the rest of my life I’d be very content. We had an incredible holiday on the east coast in December last year but I’ve loved every visit we have made. A friend of mine is just starting a large garden there and I’m very envious. Now that makes two of you for me to be envious of! Like Kathie, I’d just love to see some photos as it starts to develop. Catherine Shields is a very talented lady, so I am quite sure you will do very well. sense of place here from both the view of surrounding mountains (just glimpses not panoramas, but it’s enough for my soul to breathe deep) and the fynbos planted in the garden which echoes something of the distant slopes. And our garden is visited by sunbirds. For me, first the view, then the potential garden (we chose a green space), and the house can be renovated to suit. It sounds idyllic, Diana. Views and plantings and sunbirds! You are definitely getting me excited for my trip to South Africa! It’s lovely to hear that you have found your piece of paradise in the world. the Agapanthus in the Dutch garden could be – our history in Cape Town ‘begins for settlers’ with Jan van Riebeeck, and I’m sure Agapanthus headed for Holland long ago. Ah, yes. I hadn’t thought about the Dutch connection for the Agapanthus. No doubt they did bring them back many years ago. It’s interesting to join all the dots!